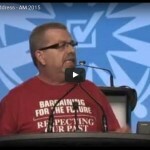 ETFO Annual Meeting 2015 | Bargaining for the future. Respecting our past. 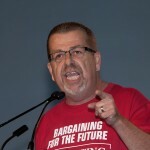 Video of President Hammond’s closing address outlining ETFO’s Phase 2 work-to-rule is available on our Archived Videos page. After some spirited debate on resolutions, budget chairperson Susan Swackhammer led the final review of the budget. The 2015-16 budget was passed as amended by delegates just after noon. 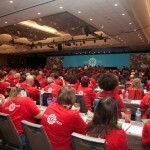 On the agenda for Thursday: continued work on resolutions, final review and approval of the 2015-16 budget, and the President’s Closing Remarks Our delegates are wearing red t-shirts emblazoned with the message ‘Bargaining for the Future . 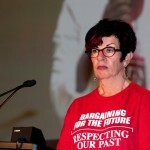 . . Respecting Our Past’.